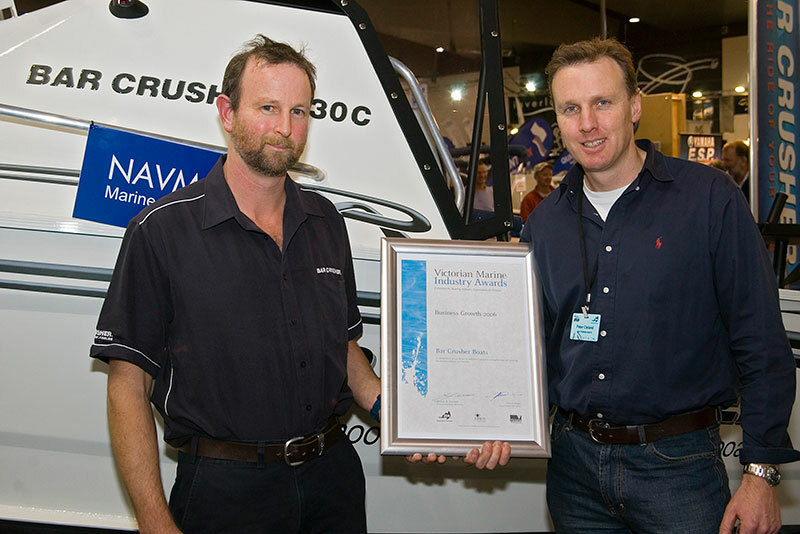 Melbourne-based Bar Crusher Boats is the 2006 recipient of the Marine Industry Award for Business Growth. Reinforcing the plate-aluminium boat manufacturer’s success, the award officially acknowledges outstanding achievement and growth in the marine industry. Bar Crusher director Peter Cleland said the announcement of the award during the recent Melbourne Boat Show was “completely unexpected”. “We launched Bar Crusher at the Melbourne Boat Show in 2000, so to be recognised with this award at this early stage in our development is fantastic,” Peter said. The beauty of being a medium-sized industry player, according to Peter, is that Bar Crusher is always quick to turn customer feedback into improved design and performance. “It’s simple, really – we listen, we learn, we improve,” he said. “Building business fast is also about great relationships with dealers, and we’re very grateful for our dealer partners who work very hard with us to grow Bar Crusher. Bar Crusher’s current range of expertly-engineered, well-constructed and smooth-riding boats is comprised of cuddy, hard-top and walk-around models – from 5.30m to 6.40m in length – suited to a wide variety of fishing and diving applications. Visit www.barcrusher.com.au to check out the impressive range today!